As deadline for self-deportation of African illegal immigrants approaches, Shas chief says preferable to hire PA Arabs over infiltrators. Shas chief and Interior Minister Aryeh Deri encouraged business owners in Tel Aviv to avoid hiring illegal immigrants, and to instead hire Palestinian Authority residents with work permits allowing them to enter pre-1967 Israel. 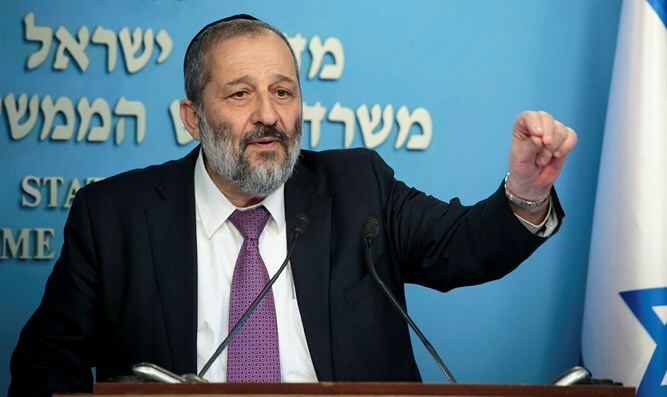 Speaking with Army Radio on Thursday, Deri said Israel had an interest in improving the material conditions of Palestinian Authority residents, but was unable to sustain large numbers of infiltrators. “If I’d have to choose whom to give work to, obviously I’d prefer the Palestinians have food to eat, since they live with me in the same land,” Deri said. Illegal immigrants, however, present a serious burden to Israel’s economy, Deri said. Tens of thousands of illegal immigrants crossed into Israel from the Sinai desert prior to the construction of a border fence, completed in 2013. Following the completion of the fence, the number of illegal crossings across Israel’s southern border plummeted, falling to zero by the year 2017. Prior to the fence’s completion, however, some 60,000 illegal immigrants, dubbed “infiltrators” in Israel, managed to enter the country. The illegal immigrants, mostly citizens of Eritrea, Sudan, and Somalia, settled primary in south Tel Aviv and neighboring cities, as well as the southern city of Eilat. Despite efforts by the government to encourage the infiltrators to leave the country, some 38,000 remain – not including children born in Israel. While the overwhelming majority have not qualified for asylum, Israel has hitherto not implemented large-scale deportation programs. When the government proposed to deport those unwilling to leave voluntarily for compensation, the Supreme Court struck down the program. A new deportation plan, slated to begin in April, was approved last December. A majority of Israelis back the deportation plan, a recent poll by the New Wave Research agency says, with 58% backing deportation of the infiltrators, compared to just 23% who oppose the expulsions.